Inostroza named his shelter Atalaya, which means the crow’s nest of a ship, wherein crew members can glimpse the horizon. 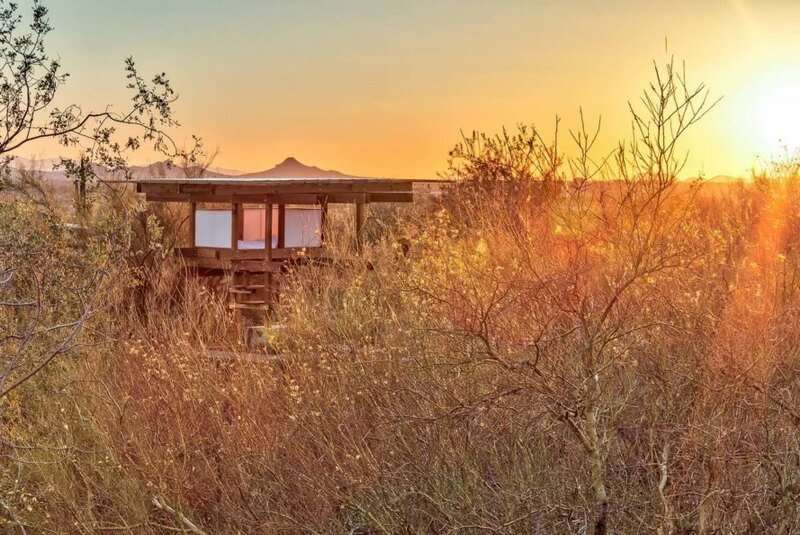 In his design statement, Inostroza said he wanted to build a sleeping shelter that would let him “dwell within the horizon of the Alameda of the Palos Verdes.” Atalaya is 12 feet tall, the same height as many of the surrounding trees. 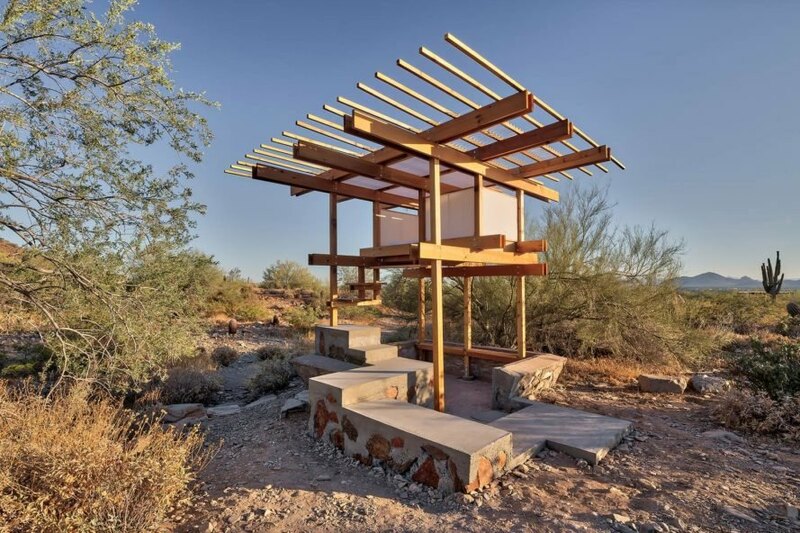 With just a $2,000 budget from the school – and honoring Wright’s principles of sustainable design – Inostroza incorporated local stones into his shelter, and reused an old concrete pad resting on the site as a plinth for his new structure. Western red-cedar comprises the wooden parts of the shelter, a type Inostroza chose because it can last for 25 years and was more beautiful than another type of wood he could have picked such as pine. A wall-stair provides access to a small sleeping chamber. Fabric panels intended to amplify the surrounding desert colors cover Atalaya. 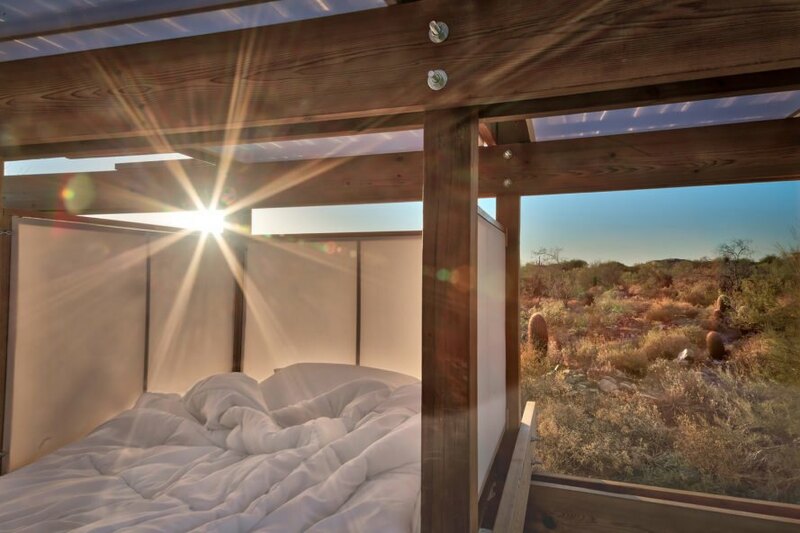 Inostroza also considered light and the way it changes daily in the desert; he said the site of his sleeping shelter “becomes a distiller of the light” at sunset. 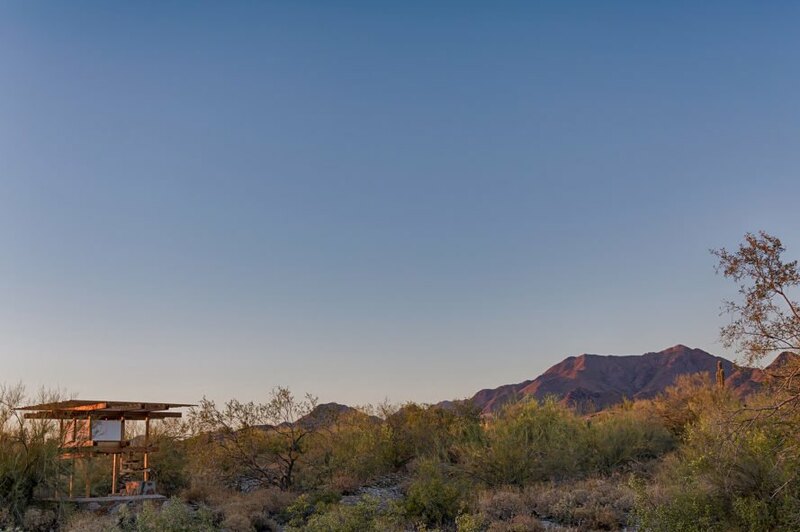 Atalaya Shelter is a small sleeping shelter in the Arizona desert. Inostroza used western red-cedar for Atalaya Shelter. The shelter is 12 feet tall, around as tall as the surrounding trees. Atalaya is the word for the crow's nest of a ship. The shelter rests on an old concrete pad and includes local stones. At sunset the site "becomes a distiller of light" according to Inostroza. 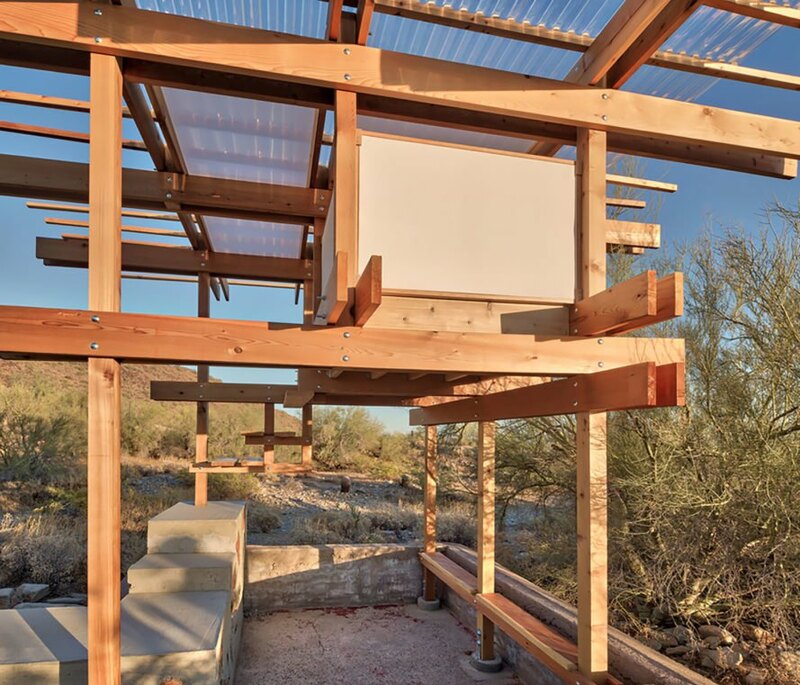 Fabric panels meant to amplify the surrounding desert colors cover the shelter. A wall-stair provides access to the sleeping chamber. Inostroza had a budget of just $2,000 from the school. 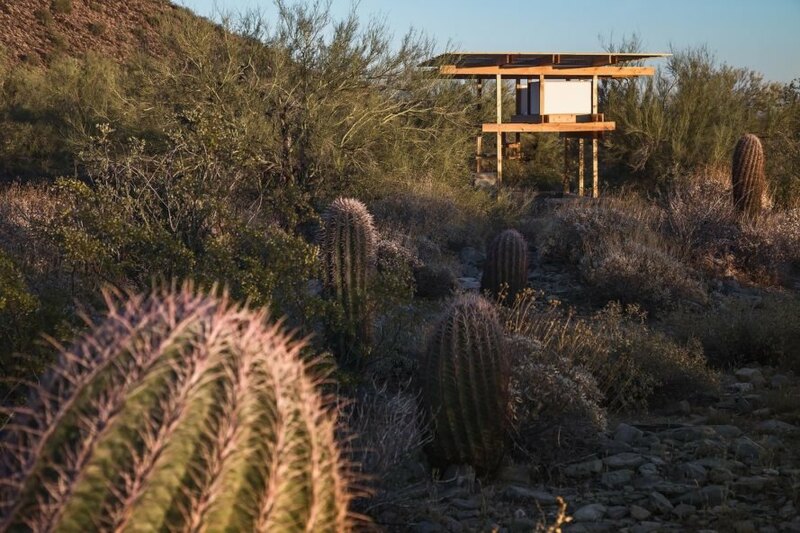 Students at The Frank Lloyd Wright School of Architecture, Taliesin West have erected small sleeping shelters on the school's Arizona desert property in for decades, hearkening back to the early days of the school, when young architects resided in tents as they built the permanent building. 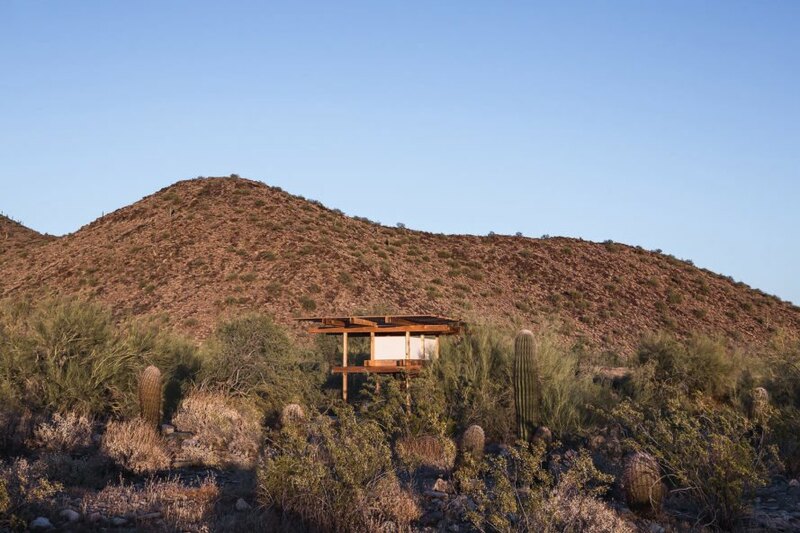 Chilean architect Jaime Inostroza just raised his own tiny shelter, and in keeping with the principles of the famous architect it is meant to "respond to the landscape of the Sonora desert." 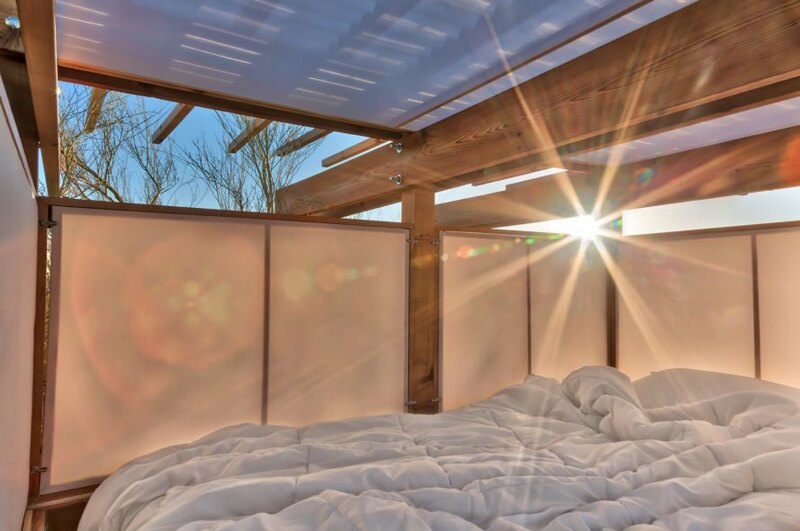 Inostroza's gorgeous shelter plays with the light and warm colors of the desert.